I'm a bit stuck for a decent blog post ("again?" you say...) mainly due to my not having done anything other than sleep and make Christmas presents that I cant show yet! I've been keeping the most awful hours lately - I'd had a long spell of not sleeping at all during the night which naturally leaves me useless during the day, and when you've got pressies to make I just gave in and got up whenever I woke up...well, I've heard I'm not the only nutter person who got up in the wee small hours to sew! Now, off to make the (veggie) sausage rolls, the cheesecake, and wrap Aunties presents. Merry Christmas one and all! Thanks for the smile! Merry Christmas! So not the kind of plant I was expecting. Happy holidays! Yor potted plant beets a pointsettia hands down every time! I love it, looks glorious in all it's finery! Merry Christmas to you, Auntie and Elliecat! I saw on the News that Tesco were arranging for a Hercules to fly in supplies! Thank goodness for Hercules!! Hope he brings you something yummy! Sounds like you have everything under control - maybe I should actually wrap our presents!? Drat those secret presents! I'm in the same boat. I can't show off what I've been making because the people I would show off to are the people recieving the items. Thank goodness xmas is right around the corner. 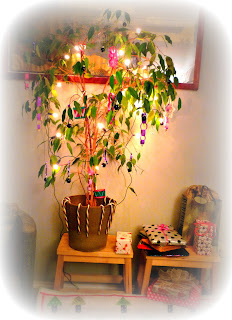 I love the potted plant-tree! I hope you can get back to a normal routine after the holidays - although it gets dark so much who would know when was the day time. I wish you a Merry Christmas and wonderful new year. And thank you so much for your lovely comment and my most recent quilt. I tried to reply by email, but it bounced back, I'm not sure why. Reminds me muchly of our Christmas Ficus. That was our tree for a few years. We had my grandmothers vintage red feathered clip-on birds that made it so festive that we kept them on it year round and just took down the lights :) Merry Christmas! Merry Christmas! Sorry it's not a real Christmas tree but you've done a good job of making it Christmassy! Never thought bout problems like getting Christmas trees! Good job you have a pan B! Merry Christmas lovely. Pot plant looks great! You have the very best of Christmases! Love your 'tree' and hope all the food goes down a treat. Happy Crimbo to you & Ms Elliecat … hope you have a fabuloso snugaroso lovely day! I'm in much the same blog-drought because most of my makes are presents boat..
Sarah, hope you had a wonderful Christmas! The potted plant should have helped with that, it is lovely!! A very good new year to you and i do hope we´ll meet again next year in London! !